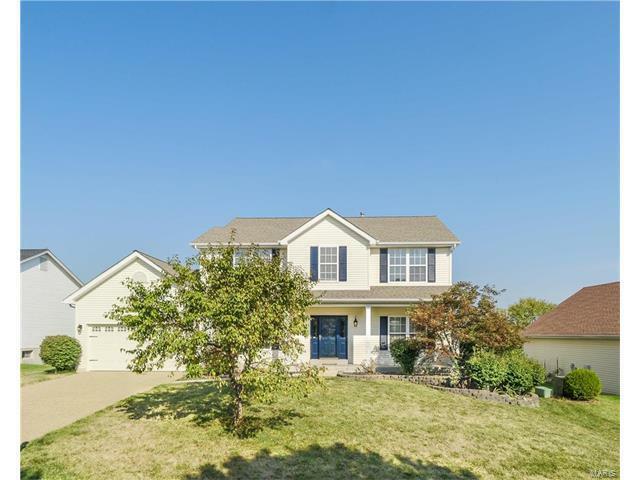 Welcome to this lovely 2 story home with 4 bedrooms and 2.5 baths. Upon entering you will notice the 9' ceilings on the main level that lead you to the formal dining room and living room. The spacious family room has a wood burning brick fireplace and opens to the breakfast room and kitchen. The bay in the breakfast room allows for extra space and leads to a deck overlooking the flat yard. An open T-staircase leads you to the second floor loft and 4 generous size bedrooms. Double door entry into the master suite and the master bath.The master bath has double bowl vanity, large garden tub with separate shower, enclosed toilet and walk-in closet. The walk-out lower level has plenty of space to finish to your liking with a rough-in for a bath and a patio outside of the slider. You will not be disappointed with the location and space this home has to offer. HWY K to south on N. Right on Floral Drive and right on Moondance Drive. Home on left.